Adding to the list of Hello Kitty's dominance in Japan, Sanrio's world-famous Hello Kitty is teaming up with the veteran noodle makers Edo-Tamagawaya for a special edition of their Tonkotsu Ramen. Edo-Tamagawaya has been around for 80 years, creating top-quality ramen noodles and special variants like Protein Udon, Protein Pasta, Fire Curry Udon, and Mansaku Udon. 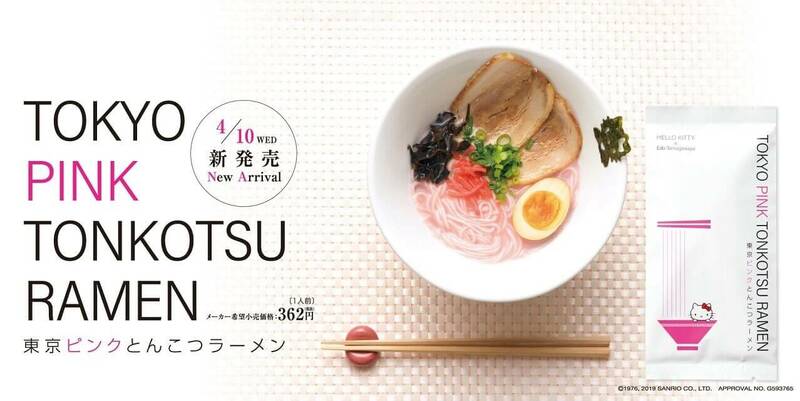 This new edition which goes on sale for a reasonable 362 Yen is a lovely pink edition to the popular Tonkotsu-style ramen. Featuring a pink broth to match the Hello Kitty motif, the noodles come with a piece of grilled nori in the shape of Hello Kitty. Given the global success of Hello Kitty and how Tonkotsu ramen has grown to the center of attention in the ramen world, this collaboration is the perfect blend between Japan's anime culture and rich foodie offerings. Given Tokyo has more Michelin stars than any other city, it's no wonder Hello Kitty is teaming up with Edo-Tamagawaya for her own take on the popular dish. The packets for Hello Kitty's Tokyo Pink Tonkotsu Ramen are available at various Sanrio retailers, such as: Hello Kitty Japan DiverCity Tokyo Plaza, Sanrioworld Ginza, Sanrio Gift Gate, Sanrio Gallery, and other official Sanrio/Hello Kitty retailers. For only 362 Yen, these unique Tokyo Pink Tonkotsu Ramen sets are sure to be a hit among Anime fans, foodie fans, and anyone who's been craving a pink bowl of ramen!